A portrait of a dog with an apparent wound on its head. 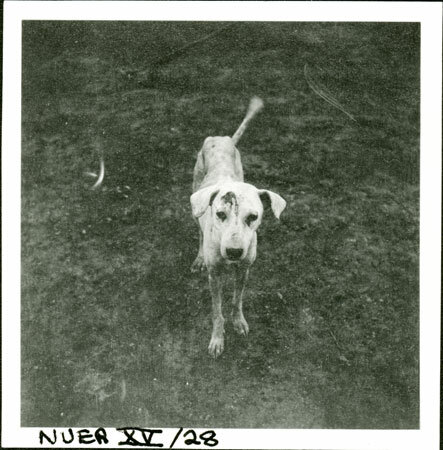 Dogs were used by the Nuer for occasional hunting of antelope and other game. Based on the film number, this dog was photographed at Yakwach on the Sobat River, which Evans-Pritchard revisited in 1935. Note on print reverse ms pencil - "43 2 A85" & print front border ms ink - "NUER XV/28"
Morton, Chris. "Nuer dog" Southern Sudan Project (in development). 03 Jan. 2006. Pitt Rivers Museum. <http://southernsudan.prm.ox.ac.uk/details/1998.355.714.2/>.